A few years back, in August 2011, I stumbled into an article about Betterment. So I decided to give it a try. Betterment is an online investment tool that empowers investors to blend bonds and stocks into a single investment account. It makes investment smart, safe, and effortless in a very cost-effective way. You get to decide the how much gets invested in stocks vs. bonds as a percentage of the total amount. For example, if you invest $100, and set up your percentage allocation 60% stocks and 40% bonds, then $60 will get invested into the stock ETF bucket below and $40 would get invested into the bond ETFs below. You can change the percentage allocation between stocks and bonds at any given time. There is no minimum investment required and dividends get automatically reinvested. 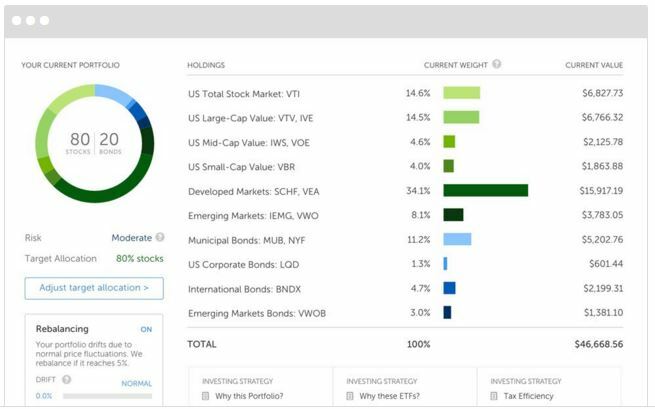 Below is the portfolio of stocks and bond ETFs your money gets invested in. Fees: It varies between 0.15% – 0.35% based on how much you invest which is significantly lesser than what a typical financial adviser would charge. You would probably spend more money on Starbucks coffee a year than on Betterment fees in my humble opinion. If you are DIY investor like me, you are probably thinking, I could invest in all these ETFs myself without going with Betterment. Yes, you could, however, you will end up paying brokerage commissions each time you invest / purchase these ETFs from whichever brokerage firm you choose to go with. This would result in fees paid in commissions to your brokerage firm to be at least 2+%, more likely to be around 4-5 times the amount you would pay as fees to Betterment. In addition, you will be spending so much of your time managing and re-balancing your portfolio at much higher price point. Customer Service: Their customer service is very good. I have called them and also emailed them questions over the past few years. They have always been polite and do their very best in answering my questions. Investing with Betterment.com is probably one of the best investment decisions I have made, and I am so glad I did it. Go ahead and give it a try.